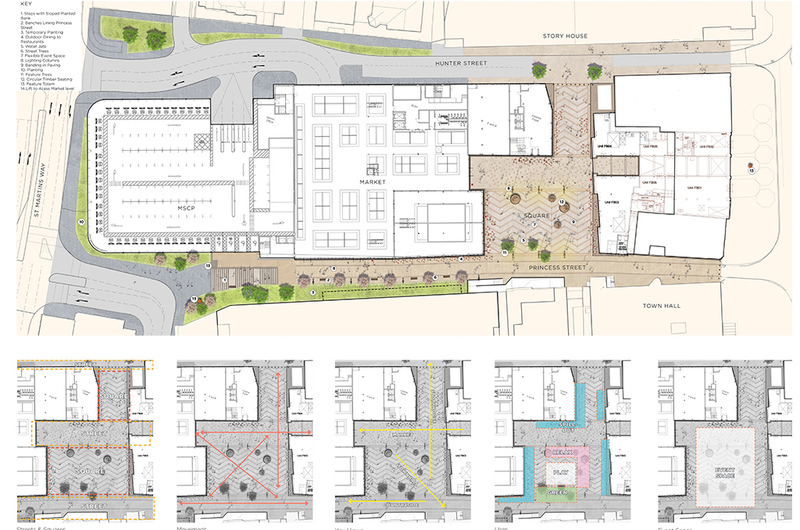 The Chester Northgate scheme provides a unique opportunity to create a new public square for the City of Chester. Set at the heart of the civic quarter, this square provides the linking element between the new market hall, the regenerated Hunters Walk, Storyhouse and the Town Hall. The square aims to bed itself within the existing Chester character and will provide improved pedestrian links to Town Hall Square and St Martins Way combined with enhanced views towards the Town Hall and the distant Cheshire landscape. The square will provide a family friendly, inviting and quality piece of public realm for residents and visitors alike and will support the functions of the adjacent buildings by enabling outside dining and street cafe culture within a car free environment. This attractive, engaging and animated space has been designed to support a flexibility of use, enabling the new square to host a range of external events from pop-up markets to seasonal and musical celebrations as well as supporting the City’s existing events programme. Materials will follow the pallet already present within the City, utilised in different patterns in order to establish an identity unique to the new square. Trees and planting will be incorporated where at all possible to enhance the proposed green walls of the development and to increase the City’s green infrastructure.